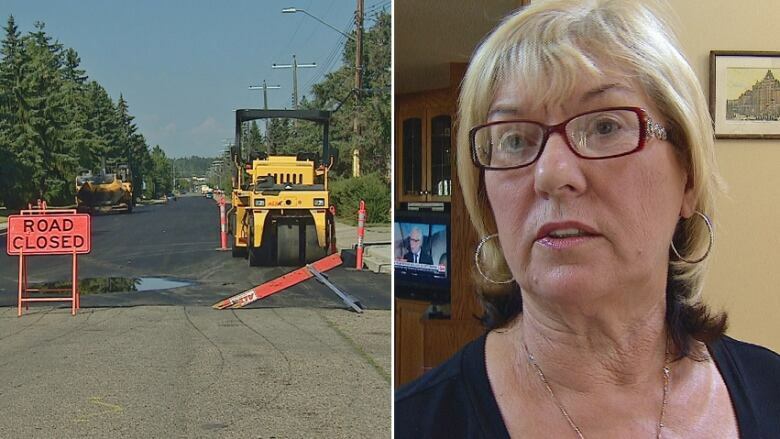 Nearly a decade after Inga Pollhaus and her neighbours agreed to pay the City of Calgary thousands of dollars to pave their gravel road, nearby streets are getting pavement at no cost. Pollhaus remembers going door to door in 2008 with a petition asking neighbours on gravel roads in the northwest neighbourhood of Bowness to agree to an additional levy on their property tax bill that would pay for paving. "I had people slamming their doors in front of me," she recalls. "One lady started crying and said, 'No, I can't afford to pay.'" Pollhaus only gathered enough support to pave her own street. While she paid her share of the bill — $4,700 — up front to save on the interest, some of her neighbours are still paying, and will be until 2022. Now, three blocks of gravel streets nearby — where homeowners had refused to sign the petition — are getting paved at no cost to the residents. "I think we should be reimbursed for the amount that we paid," she said. "We have quite a few people living in condos on the corner. Some of those people are still paying monthly payments on their taxes. There are single mothers in there and they can't afford it either." Stephen Cole bought his home in Bowness in October and noticed the additional levy. "It's a little extra bump on the property taxes," he said. "Now that I know I'm paying — and some of my neighbours have paid a considerable sum up front — and other people haven't paid, I find it shocking." It's the municipal government's responsibility to ensure roads are safe and well maintained, regardless of residents' ability to pay a huge levy, Cole said. City Coun. Ward Sutherland says he is investigating if similar situations have occurred before, but says a tax rebate may be too complicated. "Policies are changed 10 years later or five years later and stuff like that — if you ended up rebating absolutely everybody it might cause issues across the board." Sutherland says paving old gravel streets may save the city money in the long run. "If it's costing taxpayers more money to do maintenance on a regular basis than it would be to actually replace it and pave it, then we're going to go for it and make the decision to pave certain sections."